Overview: Goldline International is a precious metals brokerage based out of Los Angeles that traces its origins back to 1960. The company offers 2 main services: precious metals IRAs, as well as direct retail of the 4 primary metals: gold, silver, platinum, and palladium. Goldline is also an exclusive dealer for several gold and silver bullion coins issued by the Royal Canadian Mint and the Perth Mint Australia. The company is also a sponsor of prominent conservative TV personality, Glenn Beck. Goldline was the subject of controversy in the early part of the decade (circa 2012), related to misleading information and after the settlement of a lawsuit, has since been legally required to maintain stricter disclosure standards, particularly in relation to its markups. Goldline sets itself apart in 3 main ways: clear spread disclosures, price volatility protection programs, and the offering of exclusive coins. First, Goldline clearly discloses its spread on its website; as of this writing it charges a spread of 13% on one-ounce or larger bullion bars, one-ounce bullion coins, one-ounce, two-piece set and four-piece set American Eagle Proof coins, U.S. gold coins minted prior to 1933 and 90% silver dimes and quarters while it charges a 28% spread on coins or bars smaller than an ounce. It also clearly discloses the customer’s breakeven appreciation amount of 14.94% for the former and 38.88% for the latter, not including liquidation fees (currently standing at 1%) and other costs. Goldline refers to this disclosure as TrueCost pricing. While dealers are legally prohibited from guaranteeing buyback, Goldline states that historically it has always bought back its own products. Second, Goldline offers several programs to customers to manage post-purchase price volatility, namely its Price Guarantee Program, Two Way Price Guarantee Program, and Price Shield Program. Said programs allow qualifying purchases ($10,000 and over for Price Guarantee, $75,000 and over for Price Shield), customers are protected from price volatility after locking in their purchase price. For example, in the Price Guarantee Program, if a customer bought $10,000 worth of gold coins at $250 each, and the price declined to $230 within the program period (varies), the customer may request once to have his purchase repriced at the lower value. The Two Way Price Guarantee Program allows a customer to benefit if the price increases post purchase by allowing the customer to make a second order at his original purchase price. Price Shield works in a similar way for periods ranging from 3 months to a year, however Goldline makes up the difference in additional coins and bullions. Few companies can maintain a perfect record of zero complaints at major consumer protection agencies like BBB and BCA, but one of the most trustworthy brokers in the industry still has a perfect record. Should you consider them for your gold or silver IRA? Click to see how Goldlline stacks up against the best gold companies! Goldline’s website has a simple layout with a rather dated look. Compared to its competitors, Goldline’s consumer education section is very small; the company does not have a blog, videos, or learning center. Due to this, the website is extremely easy to navigate and each section is clearly categorized. There is also no in-your-face style advertising or popups that are endemic to many modern websites today. Overall, Goldline’s website is simple and basic albeit with a rather dated look. Goldline maintains five main social media presences: Facebook, Google Plus, Twitter, LinkedIn, and YouTube. 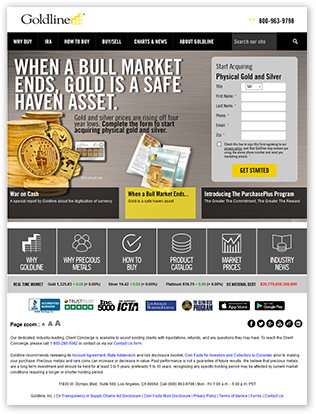 The company also has an iTunes and Google Play app for gold prices and news. Goldline International is one of the largest metals retailers in the United States and has been the recipient of much bad press and publicity in the past. Its detailed disclosure practices do set it apart from its competitors; however it appears that such practices were only implemented due to a legal mandate as a result of a lawsuit. Nonetheless, their price volatility protection programs are also a great incentive that are not legally mandated but do still distinguish themselves from the pack. Ultimately, prospective consumers will have to do the necessary due diligence and determine for themselves whether or not to do business with this company.